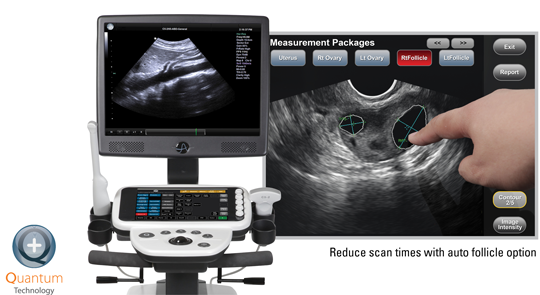 Ultrasonix ultrasound systems offer features and special options intended to save time and guide patient care. The SonixTouch for IVF has an intuitive touch screen that is customisable for your specific needs. With no extra buttons and knobs, you will only see the controls you need for the current procedure. Simply touch the screen for measurements and to record patient data. The Auto Follicle option on the SonixTouch Q+ can reduce exam scan times up to 50%. Using our auto advance measurement feature, the system will automatically capture and record measurements as you tap the image of each follicle on the screen.